This post was originally feature on Chicago Poker Club on July 27, 2009. If you caught last night's Windy City Poker Championship, you heard me comment on a few hands of a recent televised final table. In one particular hand, we witnessed Kevin Thanonsinh make a big bluff with half of his chips out of the small blind, holding 9-4 off-suit. Brian White, in the big blind, wakes up with a big hand for this stage in the tournament an Ace-9 off-suit, having Kevin dominated. Kevin has committed half of his chips, and if Brian raises he'll either fold. getting 3:1 on his money, or will call completely dominated for his tournament life. What happened here? How did Kevin make this bluff, and why did Brian fold? The key to long-term success in poker is understanding your opponents' playing styles and tendencies, and looking for opportunities to exploit them. If your opponent plays too loosely, making calls out of position with mediocre holdings, you need to punish him/her by making big raises with premium holdings. If you flop your hand, bet for value on every street. There's no sense getting tricky with an opponent if they'll call you all the way down with one pair and no kicker. If your opponent is too tight, don't let them limp. Your tight opponent limps in middle position, you know he or she doesn't have a premium holding. If they can't call a raise, you'll pick up the extra chips, which add up quickly. If they do call the raise, they will fold to a continuation bet unless they flop a strong hand. Finding out which is which generally won't be too expensive. In the prior hand, Brian demonstrated that he was playing the tournament for survival, and that he was playing extremely tight poker. When the players folded all the way around to Kevin in the small blind, he knew he only had one player to beat, and that player was playing way too tight. He exploited this flaw in Brian's game, and Brian demonstrated a tightness in excess of what Kevin likely suspected. In the prior hand, Brian found himself in early position with a suited AQ. He made a minimum raise to 20k chips. Another player, David Marcus, sitting in middle position also found AQ suited, and decided to make the call. Getting almost 6:1 on his call, Kevin makes the call of one additional big blind to see a flop with two suited cards. He checks dark. The flop comes Q-high (Qs 8d 7h), exactly what Brian had hoped for, and he leads out for a bet of 40k chips into a pot of 71k. David also hits his top-pair top-kicker, and reraises for the rest of his chips, an additional 36k in chips, ballooning the pot to 187k. Kevin quickly folds, and Brian goes into the tank, facing a reraise that will pay him over 5-to-1 on a call. Brian did much of his thinking out loud, and was concerned that David might have flopped a set of 7s or 8s. This is certainly a possibility, as I commented on the show, but when you're 6-handed, late in a tournament, you raise with a premium hand, you're short on chips, and you hit your flop, you are going to commit yourself to the hand. If your opponent flopped a monster, like a set, you simply got unlucky, and you're going to go broke. The rest of the table notices how slowly Brian acted in making the call, and how tightly he's playing. The good players at the table put this in their memory banks for future exploitation. The players at the table, and the viewers at home don't have to wait long, as Kevin takes advantage on the very next hand. When Kevin bets 30k into Brian, Brian doesn't even think for more than 15-20 seconds before folding his relative monster. Kevin then turns his hand face up to show it (incidentally, I'm not a fan of this sort of advertising). Brian realizes that not only was he ahead, he had Kevin dominated, as they were sharing a 9. (Brian was better than a 3:1 favorite.) Brian comments to Kevin what he had, "I had an Ace Nine off". Kevin's only response is "Wow." And so was mine. 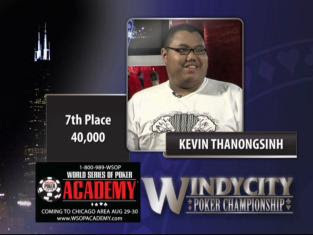 Tune in to Windy City Poker Championship to see what happens next!